This article is about the city. For the form of poetry, see Limerick (poetry). For other uses, see Limerick (disambiguation). very fierce in the skills of war"
Limerick (/ˈlɪmərɪk/; Irish: Luimneach [ˈl̪imʲɨnʲəx]) is a city in County Limerick, Ireland. It is located in the Mid-West Region and is also part of the province of Munster. Limerick City and County Council is the local authority for the city. The city lies on the River Shannon, with the historic core of the city located on King's Island, which is bounded by the Shannon and the Abbey River. Limerick is also located at the head of the Shannon Estuary where the river widens before it flows into the Atlantic Ocean. With a population of 94,192 (2016 census), Limerick is the third most populous urban area in the state, and the fourth most populous city on the island of Ireland. The Limerick City Metropolitan District had a population of 104,952. On 1 June 2014 following the merger of Limerick City and County Council a new Metropolitan District of Limerick was formed within the united council which extended the city area. The Metropolitan District includes the city urban area and extends outwards towards Patrickswell in the west and Castleconnell in the east. The City Metropolitan Area however excludes city suburbs located within County Clare. Limerick is one of the constituent cities of the Cork–Limerick–Galway corridor which has a population of 1 million people. It is located at a strategic position on the River Shannon with four main crossing points near the city centre. To the south of the city is the Golden Vale, an area of rich pastureland. Historically, much of the city's industry was based on this rich agricultural hinterland and it is particularly noted for Limerick Ham. Luimneach originally referred to the general area along the banks of the Shannon Estuary known as Loch Luimnigh. The earliest settlement in the city, Inis Sibhtonn, was the original name for King's Island during the pre-Viking and Viking eras. This island was also called Inis an Ghaill Duibh, "The Dark-(haired) Foreigner's Island". The name is recorded in Viking sources as Hlymrekr. The city dates from 812 which is the earliest probable settlement; however, history suggests the presence of earlier settlements in the area surrounding King's Island, the island at the historical city centre. Antiquity's map-maker, Ptolemy, produced in 150 the earliest map of Ireland, showing a place called "Regia" at the same site as King's Island. History also records an important battle involving Cormac mac Airt in 221 and a visit by St. Patrick in 434 to baptise an Eóganachta king, Carthann the Fair. Saint Munchin, the first bishop of Limerick died in 652, indicating the city was a place of some note. In 812 the Vikings sailed up the Shannon and pillaged the city, burned the monastery of Mungret but were forced to flee when the Irish attacked and killed many of their number. The Normans redesigned the city in the 12th century and added much of the most notable architecture, such as King John's Castle and St Mary's Cathedral. In early medieval times Limerick was at the centre of the Kingdom of Thomond which corresponds to the present day County Clare, the Kingdom also included North Kerry and parts of South Offaly. One of the kingdom's most notable kings was Brian Boru, ancestor of the O'Brien Clan of Dalcassians. The word Thomond is synonymous with the region and is retained in place names such as Thomondgate, Thomond Bridge & Thomond Park. Limerick in the sixteenth and seventeenth centuries was often called the most beautiful city in Ireland. The English-born judge Luke Gernon, a resident of Limerick, wrote in 1620 that at his first sight of the city he had been amazed at its magnificence: "lofty buildings of marble, like the Colleges in Oxford". During the civil wars of the 17th century the city played a pivotal role, besieged by Oliver Cromwell in 1651 and twice by the Williamites in the 1690s. The Treaty of Limerick ended the Williamite war in Ireland which was fought between supporters of the Catholic King James II (Jacobites) and the Protestant King William of Orange (Williamites). The treaty offered toleration to Catholicism and full legal rights to Catholics that swore an oath of loyalty to William III and Mary II. The Treaty was of national significance as it ensured closer British and Protestant dominance over Ireland. The articles of the Treaty protecting Catholic rights were not passed by the Protestant Irish Parliament which rather updated the Penal Laws against Catholics which had major implications for Irish history. Reputedly the Treaty was signed on the Treaty Stone, an irregular block of limestone which once served as a mounting block for horses. This stone is now displayed on a pedestal at Clancy Strand. Because of the treaty, Limerick is sometimes known as the Treaty City. This turbulent period earned the city its motto: Urbs antiqua fuit studisque asperrima belli (An ancient city well studied in the arts of war). The peace times that followed the turmoil of the late 17th Century allowed the city to prosper through trade in the late 18th century. During this time Limerick Port established itself as one of Ireland's major commercial ports exporting agricultural produce from one of Ireland's most fertile areas, the Golden Vale, to Britain and America. This increase in trade and wealth, particularly amongst the city's merchant classes saw a rapid expansion of the city as Georgian Limerick began to take shape. This gave the city its present-day look including the extensive terraced streets of fine Georgian townhouses which remain in the city centre today. The Waterford and Limerick Railway linked the city to the Dublin–Cork railway line in 1848 and to Waterford in 1853. The opening of a number of secondary railways in the subsequent decades developed Limerick as a regional centre of communications. However, the economic downturn in the European conflicts of the French Revolution and Napoleonic eras, and following the Act of Union 1800, and the impact of the Great Irish Famine of 1848 caused much of the 19th Century to be a more troubled period. The Limerick boycott was an economic boycott waged against the small Jewish community for over two years in the first decade of the twentieth century. It was accompanied by a number of assaults, stone throwing and intimidation, which caused many Jews to leave the city. It was instigated in 1904 by a Redemptorist priest, Father John Creagh. During the Irish War of Independence, the Limerick Soviet was a self-declared soviet that existed from 15 to 27 April 1919. A general strike was organised by the Limerick Trades and Labour Council, as a protest against the British Army's declaration of a "Special Military Area" under the Defence of the Realm Act, which covered most of Limerick city and a part of the county. During the strike a special strike committee was set up to print their own money, control food prices and publish newspapers. By the mid-20th century, Limerick was characterised by economic stagnation and decline as many traditional industries closed or left the city. However, there were some success stories. In 1942 Shannon Airport (located in County Clare, 20 km west of the city) opened for the first time offering transatlantic flights. In 1959, Shannon Airport enabled the opening of the Shannon Free Zone which attracted a large number of multinational companies to the region. A long campaign for a third level educational institute to be located in the city finally bore fruit with the establishment of NIHE Limerick in 1969 which eventually became the University of Limerick in 1989. The local government area of Limerick city is under the jurisdiction of Limerick City and County Council. The Council has responsibility for local services such as sanitation, planning and development, libraries, collection of motor taxation, local roads and social housing in the city. The council comprises elected ward Councillors with an appointed full-time CEO as the city (and county) manager. Local elections are held every five years and the Councillors annually elect a Cathaoirleach or chairman to chair the council. The current Cathaoirleach is Cllr Liam Galvin from the Newcastle West electoral area. The 21 Councillors from the 3 electoral districts in the City Metropolitan Area also elect a mayor to represent the city. The Mayoral position is largely ceremonial and has much reduced responsibility following the merger of the Limerick local authorities. Although the Mayor is the city's first citizen, within the council the position is below that of the Cathaoirleach. The current mayor is Councillor Jerry O'Dea. Former well-known mayors include TDs Donogh O'Malley, Stephen Coughlan, Michael Lipper, Jim Kemmy and Jan O'Sullivan. Throughout most of the city's history; from 1197 when it gained its first charter, Limerick City had its own local government authority, Limerick Corporation later known as Limerick City Council. The council was one of the oldest in Ireland and was only exceeded in age by Dublin City Council. In October 2012 the Government of Ireland published Putting People First- Action Programme for Effective Local Government which set out Government policy for reforms across all the main areas of local government in Ireland. Among the recommendations was the merging of Limerick City Council with Limerick County Council. The changes came into effect on 1 June 2014 following the implementation of the Local Government Reform Act 2014. By the 1960s onwards the city had outgrown its boundary considerably; the city boundary was only altered slightly and never reflected the overall urban area of the city. A limited boundary extension on the city's north side in 2008 enlarged the city boundary by 1,020 hectares increasing the city's area by almost 50% and raising the population by an estimated 7,000. The previous boundary, encompassing 2,086 hectares, was delineated in 1950. Newer suburban districts such as Dooradoyle, Castletroy – including the University, Gouldavoher, and Raheen were continually administered to by Limerick County Council until the merger of the two authorities in June 2014. This local government structure in Limerick caused a number of inefficiencies, most notably in the area of planning. A number of suburbs such as Westbury and Parteen to the north of the city are governed by Clare County Council. Fianna Fáil is the largest party on the united authority with 13 seats followed by Fine Gael with 12, Sinn Féin have 6, Anti-Austerity Alliance, Labour & Independents have 3 seats each. For national Dáil elections Limerick City is in the Limerick City constituency. From 2011, the constituency boundaries changed in accordance with the proposals of the Constituency Commission and the subsequent Electoral (Amendment) Act 2009. This changed the electoral boundaries from Limerick East and Limerick West to Limerick City and Limerick. Limerick city encompasses the city, the suburban areas of Castletroy and as far east as Castleconnell. It also includes part of south County Clare. The Limerick county constituency takes in most of the rest of the county. For European parliament elections Limerick is in South Ireland. Limerick's climate is classified as temperate oceanic (Köppen Cfb). Met Éireann maintains a climatological weather station at Shannon Airport, 20 kilometres west of the city in County Clare. Shannon Airport records an average of 977 millimetres of precipitation annually, most of which is rain. Limerick has a mild climate, with the average daily maximum in July of 20 °C (68 °F) and the average daily minimum in January of 3 °C (37 °F). The highest temperature recorded was 32.0 °C (89.6 °F) in June 2018, and the lowest −11.4 °C (11.5 °F) in 2010. Limerick is the cloudiest city in the state, averaging only 1,295 sunshine hours annually, 3.5 hours of sunshine every day. There are on average 62 days of no recordable sunshine, 6 days of thunder, 22 days of hail and 11 days of snow per year. Shannon Airport is located by the ocean at an elevation of 14 metres, so snow is less common at the station than in the city itself. In 2014, Limerick became Ireland's inaugural National City of Culture, with a variety of artistic and cultural events occurring at various locations around the city throughout the year. The Limerick City Gallery of Art on Pery Square is the city's chief venue for contemporary art exhibitions. It is home to a permanent collection of Irish art, which shows works from the early 18th to 20th century. The gallery houses the National Collection of Contemporary Drawing founded by the artist Samuel Walsh in 1987. Limerick's major contemporary art event is EVA International, Ireland's Biennial of Contemporary Art. EVA International (formerly EV+A – Exhibition of Visual+ Art) is curated by a new guest curator every two years and includes contemporary artworks by both international and Irish artists. The centre of the exhibition is the Limerick City Gallery of Art, but EVA generally uses numerous other venues throughout the city including public spaces. The Lime Tree Theatre officially opened at the Mary Immaculate College campus on 30 October 2012. The venue hosts theatre, music, comedy, traditional arts, schools' performances and conferences. The Belltable Arts Centre on O'Connell Street (in liquidation as of February 2013) hosts for local playwriting and drama. Mike Finn's plays have included Pigtown, set around a century of the city's history, and Shock and Awe, a retelling of Homer's Iliad. The University Concert Hall located in UL is a 1,000 seat venue and provides a large venue for national and international acts to visit the city. Limerick is also the home of street theatre companies, including "The Umbrella Project". Limerick's literature scene is supported by projects like the Limerick Writers' Centre, which was established in 2008 and is responsible for a range of writing activities in the city. Limerick natives include Pulitzer Prize winning author, Frank McCourt; novelists Kate O'Brien, Michael Curtin and lately Kevin Barry and Donal Ryan. Limerick poets have also contributed to its literary heritage with Michael Hogan, Desmond O'Grady, John Liddy. Other active Limerick arts groups include Contact Studios, which provides individual studio spaces for visual artists; the Daghdha Dance Company, a contemporary dance company that has adopted a renovated church in John's Square, adjacent to St John's Cathedral, as a performance space); the Fresh Film Festival, which is held each spring, and includes films made by young people (7–18 years); Impact Theatre Company; and Limerick Printmakers Studio and Gallery, which provides printmaking facilities, a venue for exhibitions and events and an education programme. The Limerick Youth Theatre provides young people with an opening into acting and production. It received attention in the national media with its 2005 production of Romeo and Juliet, which made comparisons between the ongoing feud in the city with that of the Montagus and the Capulets in the play. The Irish Chamber Orchestra and the Irish World Music Centre are both based in the University of Limerick. The university has a thousand-seat state-of-the-art concert hall that hosts visiting performers. The city's music scene has produced bands such as The Cranberries, guitarist Noel Hogan's MonoBand, The Hitchers and others. Electronic musician Richard D. James, more commonly known as Aphex Twin, was born in Limerick in 1971. The Limerick Art Gallery and the Art College cater for painting, sculpture and performance art. Limerick is also home to comedians The Rubberbandits, D'Unbelievables (Pat Shortt and Jon Kenny) and Karl Spain. Dolan's Warehouse on the Dock Road has two venues specialising in live music; an upstairs venue which tends to accommodate comedians and folk and jazz acts, and a much larger warehouse venue holding 400. Dance music is catered for at Baker Place which holds mainly local underground nights and Trinity Rooms which has hosted acts like Hot Chip, Groove Armada, DJ Yoda and Jazzy Jeff alongside more cutting-edge acts like Dan Le Sac, Christian Smith, and Missill. The city is the setting for Frank McCourt's memoir Angela's Ashes and the film adaptation. The Frank McCourt Museum situated in Frank's former school on Hartsonge Street opened in 2011 and contains artefacts from the book. Limerick has also been the setting or location for a number of other films, including the dramas The Real Thing (2002), Cowboys & Angels (2003) and Lost & Found (2015). Riverfest is an annual summer festival held in Limerick. The festival was begun in 2004. The 2014 festival was held in May and had a record 80,000 visitors. A limerick is a type of humorous verse of five lines with an AABBA rhyme scheme: the poem's connection with the city is obscure, but the name is generally taken to be a reference to Limerick city or County Limerick, sometimes particularly to the Maigue Poets, and may derive from an earlier form of nonsense verse parlour game that traditionally included a refrain that included "Will [or won't] you come (up) to Limerick?" The earliest known use of the name "Limerick" for this type poem is an 1880 reference, in a Saint John, New Brunswick newspaper, to an apparently well-known tune. RTÉ lyric fm, a state-run classical music radio station and part of RTÉ, broadcasts nationally from studios in the city centre. Limerick's local radio station is Live 95FM, broadcasting from 'Radio House', near the waterfront at Steamboat Quay. Spin South West, owned by Communicorp, broadcasts to Counties Kerry, Clare, Limerick, Tipperary and southwest Laois from its studios at Landmark Buildings in the Raheen Industrial Estate. Student radio station, Wired FM, broadcasts on 99.9FM from Mary Immaculate College. Wired FM also has studios in Limerick Institute of Technology. Limerick Regional Hospital has a radio station on 94.2FM, but this can be heard only in the hospital and surrounding area. West Limerick 102 is broadcast from Newcastle West. The national broadcaster, RTÉ, has radio studios in the city, which are periodically used to broadcast programming from Limerick. Several local newspapers are published in the city, including The Limerick Post and The Limerick Leader and magazines include the Limerick Event Guide, Business Limerick and Limerick Now. Limerick City is a main tourist destination, only a 15-minute drive from Shannon Airport. Tourist attractions of architectural and historical note in the city centre include Limerick City Museum, King John's Castle (1210), St Mary's Cathedral (1168), the Hunt Museum, the University of Limerick, Georgian houses and gardens and the Treaty Stone. There are several seasonal tours, including Angela's Ashes walking tour of Limerick City, historical walking tour, and boat tours along the River Shannon. The city centre is divided between the traditional areas of "English Town" on the southern end of King's Island, which includes the King John's Castle; "Irish Town", which includes the older streets on the south bank; and the current economic centre further south, called "Newtown Pery". Newtown Pery was built in the late 18th century before the Act of Union and, unusually for an Irish city and unique in Limerick, is laid out on a grid plan. The Limerick City Museum (formerly aka the Jim Kemmy Municipal Museum), is located in Istabraq Hall, City Hall, Merchant's Quay. It contains displays on Limerick's history and manufactures. St John's Cathedral has Ireland's tallest church spire. The Georgian core of the city, with fine Georgian architecture in the Newtown Pery, was developed from the mid 18th century. This core includes O'Connell Street (George Street before Independence) from the Cecil Street intersection running to the south west end of the Crescent, and south-east to Pery Street including Glentworth Street and Barrington Street. Other architectural buildings of architectural note in the city are St John's Cathedral, designed by the notable Victorian architect, Philip Charles Hardwick. St Mary's Cathedral, at over 800 years old, is one of the oldest in Ireland. St John's Cathedral, whilst more modern, has Ireland's tallest spire at 94 m (308 ft). One of Ireland's most celebrated museums, the Hunt Museum, is based in the historic 18th-century former Custom House. The museum was established to house an internationally important collection of approximately 2000 works of art and antiquities formed by John and Gertrude Hunt during their lifetimes. On display are the 9th century Antrim Cross, a sketch by Picasso and a bronze sculpture of a horse, said to be from a design by Leonardo da Vinci. The main park in Limerick is the People's Park which was opened in 1877 in memory of Richard Russell, a prominent local business man. The park is dominated by the Thomas Spring Rice memorial (MP for the city 1820–1832) and has a large collection of mature deciduous and evergreen trees. Limerick city centre changed significantly with the construction of several modern high-rise buildings in the early 2000s, in particular as part of the regeneration of the former docks area along the Dock Road. The suburban areas, where the majority of the population now live, have grown out from the centre along the main roads to Ennis (North Circular and Ennis Road areas/Caherdavin), Dublin (Castletroy and the University) and Cork (Ballinacurra/Dooradoyle/Raheen). Suburban houses are generally two-floor semi-detached homes for single families. These were built from the 1950s onwards in large estates by government projects and commercial developments, although there are many examples of Edwardian and older 1930s suburban homes on the main suburban thoroughfares leading towards the city (North & South Circular, Ballinacurra Road, O'Connell Avenue). Currently tourism is growing, with over 1,000 new beds being opened in the city in 2006 thanks to the opening of five new hotels. The city provides visitors with "Street Ambassadors", people designated to help others around and make their stay more enjoyable. Limerick City has a vibrant nightlife, with numerous nightclubs and pubs giving a range of drinking experiences from the warm and cosy to cutting edge. Dolan's Warehouse is a small concert venue that hosts local, national and international folk, indie, jazz and rock acts. It is also a venue for traditional Irish music. In County Limerick, Adare village and the Foynes Flying Boat Museum, approximately 35 km (22 miles/30 minutes) from Limerick City along the scenic coastal N69 route from Limerick to Tralee, are also attractions. Bunratty Castle in Co. Clare is another local attraction of national significance. It is situated 15.4 km north of the city. Limerick is known to be the antipodes to the Campbell Islands of New Zealand. Limerick is officially the third largest city in Ireland (after Dublin and Cork) with a population of 94,192 (urban)/104,952 (metropolitan) according to the 2016 census carried out by the CSO. The past census reported a large population decline in central city areas due in part to the Limerick regeneration process where in these areas the largest reduction was reported nationally and also to outward migration following the collapse of the local and national economy from 2008 onwards. The population of the Limerick Larger Urban Zone as defined by the EU is 162,413. Limerick has a notably ethnically diverse population, and a large immigrant community, which saw especially rapid growth during the Celtic Tiger and the following decade. The Polish community is the second largest outside Dublin, with an estimated 10,000 living and working in the city. Ireland's first Polish bank opened in 2007. The African community has set up a number of churches, which are now part of the cultural makeup of the city. Limerick has a large stock of local authority housing. Prior to the merger of Limerick City and County Council 41% of all housing within the old Limerick City Council boundary was local authority, which was the highest in Ireland. This figure is however no longer accurate given the larger metropolitan district of the city. Limerick is at the heart of the region dubbed "the Midwest". 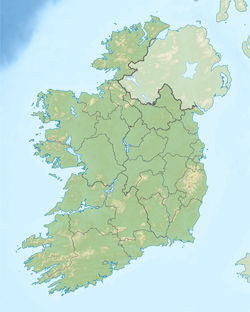 Also known as the "Shannon Region", this is primarily an economic and social concept. The region encompasses County Limerick, County Clare, North County Tipperary, Northwest County Kerry and south Offaly, with its focal point centred on Limerick and its environs within an 8-kilometre (5 mi) radius. The area is possibly the main economic region outside Dublin and Cork. Its economic success has been driven in part by the University of Limerick, Limerick Institute of Technology, Shannon Airport in Co. Clare and Shannon Development (an economic development agency), whose precursor was SFADCO (Shannon Free Airport Development Company), an economic agency that provided tax incentives to companies locating in the area surrounding Shannon Airport. As of 2006[update] Shannon Development is mostly concerned with disposing of valuable industrial park properties. Limerick Chamber of Commerce, the voice of business in the region, is a thriving organisation. Limerick Chamber celebrated its bicentennial/bicentenary in 2015. Historically Limerick was an agricultural commodity-driven economy, due to its position as the first major port along the River Shannon. By the middle of the 18th century, Limerick Port grew to become one of Ireland's principal commercial ports, exporting agricultural produce from the most fertile tracts in Ireland known as the Golden Vale as well as produce from the surrounding counties. The city was one of the main meat processing areas in Ireland, and industry included confectionery and flour production. The city was known for its Bacon Industry however this went into decline in the mid 20th Century. The fishing industry in Limerick, based on Clancy's Strand opposite King John's Castle and at Coonagh nearby, once employed hundreds of men. The boat most commonly used was the Gandelow which was also used as a small Lighter (barge) to ferry goods to and from larger ships in the port. In the 1920s the construction of a dam at Ardnacrusha severely impacted salmon breeding and that, and the introduction of quotas, had by the 1950s caused salmon fishing to diminish. By 2006, most fishermen had relinquished their drift net licences and the industry can now be said to be dormant. In line with the changing economic landscape in Ireland, many multinational companies are based in Limerick, and today the city is a growing recipient of foreign direct investment outside Dublin. Dell had its main European Manufacturing Facility at the Raheen Business Park however in January 2009 Dell announced that it would close its Limerick computer manufacturing plant and move the production lines to Poland. The facility was the largest Dell manufacturing plant outside the United States and produced 30,000–60,000 units per day for export to the EMEA. Dell remains one of the largest employers in the mid-west with over 1,000 people employed in service and support. Analog Devices has its European manufacturing base in Raheen, 3 km south-west of the city centre. The site employs more than 1,000 people. Johnson & Johnson subsidiary Vistakon (the world's largest manufacturer of contact lenses) has a large facility in Castletroy in the National Technology Park and also employs close to 1,000 people. It is Vistakon's only production facility outside the United States and one of the largest contact-lens manufacturing plants in the world. Cook Medical, the world's largest privately owned Medical Devices company, employs over 800 people in Limerick at the National Technology Park. The recent economic recession in Ireland had a profound effect on Limerick. The announcement in 2009 that Dell was to move its manufacturing facility from Limerick to Poland devastated the local economy. 1900 jobs were lost at Dell and it is believed that for every job that was lost at Dell at least another 4 to 5 were at risk. The closure of the Dell manufacturing facility amounted to 2% of Ireland's national GDP. The downturn in the construction industry also cost many jobs as did the stalled Limerick regeneration programme which promised a massive investment in Limerick's deprived city areas. As of 2012 unemployment had become a major problem across the city with the unemployment rate in the city at 28.6% which was almost twice the national average. The service industry is an important employer in the city. The Crescent Shopping Centre is the largest shopping centre in Ireland, outside of Dublin, and the largest in the province of Munster. It is located in Dooradoyle about 3 km south of the city centre, and has over 90 shopping outlets along with restaurants and a 12-screen Omniplex Cinema. The city centre also has a large retail district which includes a mix of more traditional type of shops as well as some modern high street stores. Cruises Street is one of the main shopping streets. O'Connell Street, William Street, Bedford Row and Thomas Street) are also retail streets within the city. The city centre saw some works on remodelling in the early 21st century, with pedestrianisation works on Bedford Row, Thomas Street and parts of Catherine Street, as well as widening footpaths on William Street. These works have sought to make the city centre more attractive for shoppers and visitors which has seen some decline in the late 20th and early 21st century, as the retail offering in the city centre has consistently lagged behind that of the suburban shopping centres. The result has been a severe reduction of footfall in the city centre which in turn has resulted in the closure of many city centre retail businesses which accelerated from recession of 2008 onwards. During the Celtic Tiger years a number of shopping centres & retail parks opened in suburban areas of Limerick. The 'Crescent Shopping Centre' expanded in the early 2000s to become one of the largest in Ireland. The 'Jetland Shopping Centre' in Caherdavin opened in 2005. Its main anchor is Dunnes Stores. The Childers Road Retail Park & the Parkway Shopping Centre in the east of the city also have a number of high street stores. Unfinished retail centres include the Coonagh Cross retail development and the Parkway Valley Shopping Centre on the Dublin Road. The Opera Centre was also a retail development for the city centre but is unlikely to go ahead. The Milk Market located at Cornmarket Row in the city centre sells locally produced foods and products. The market is governed by Limerick Market Trustees and is one of the oldest markets run in the country. In 2010 work was undertaken to redevelop the existing premises to an all-weather, all year round facility as it operated in an outdoor environment. The work involved constructing a large canopy over the existing market premises and was officially re-opened in June 2010. The Milk Market Project won the 2011 Royal Institute of the Architects of Ireland (RIAI) 'Peoples Choice Award'. Local architects Healy & Partners designed the project. Also involved were local civil and structural engineers Dennany Reidy Associates. Shannon Airport is 20 km west of the city in County Clare. It is one of Ireland's main airports and is easily accessible from Limerick via the N18 dual carriageway and from other regions via the Limerick Tunnel. It has scheduled flights to European and North American destinations. Airlines using the airport include Ryanair, Aer Lingus, United Airlines, American Airlines, Aer Lingus Regional and Delta Air Lines. There is no rail link to the airport. Coonagh airfield, a few kilometres west of Caherdavin, serves small private aircraft. Kerry and Cork Airports are around 1 hour 30 minutes and 2 hours drive away, respectively. 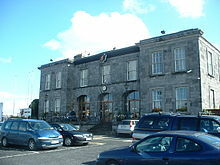 Kerry Airport is connected to Farranfore railway station, from Limerick railway station travel via Limerick Junction and Mallow. Local public transport is provided by several companies. Bus Éireann, Ireland's state-owned bus company, operates a range of services subsidised by the National Transport Authority, while a number of provide operators also run commercial bus services in and around Limerick. A new enhanced city bus network was introduced in Limerick City on Sunday 4 December 2016. A new route was introduced to the network called 304A that connects Raheen and Monaleen to the centre. Later services on all routes were also introduced with the last daily departure from the city centre at 23.30. Routes 301–306 are operated by Bus Éireann. Routes 307 and 308 were originally run by Eurobus, but have now been taken over by Dublin Coach. Buses run to towns and villages in the county and to Shannon Airport. There are also a number of Intercity and international buses from Bus Éireann's bus terminal adjoining Limerick Colbert railway station. These include hourly services to Dublin, Cork, Ennis & Galway. Bus Éireann have also commenced the 'X51' Limerick to Galway Express travelling on the M18 in addition to the regular service. Buses run every 2 hours to Tralee & Killarney. There are also regular daily services to Waterford & Athlone and a daily service to London via the ferry from Rosslare Europort. There are a number of private bus companies in operation providing city and intercity services. Dublin Coach provide the M7 express service which operates every hour from Arthur's Quay which goes to Dublin or Ennis. JJ Kavanagh also provide Dublin to Limerick services and to Shannon Airport also from Arthur's Quay. Citylink run a number of services from Limerick to Galway & Cork and operate from Henry Street. Iarnród Éireann's Limerick Colbert station is the railway hub for the city and the Mid West Region with a number of intercity and commuter rail services. Limerick railway station opened on 28 August 1858, replacing an earlier, temporary station 500 m east, which had operated from 9 May 1848. Limerick to Dublin Heuston: 16 services daily including 4 direct services. All remaining Dublin – Limerick services require passengers to change to the Dublin to Cork train at either Limerick Junction or at Ballybrophy railway station. Limerick to Waterford: 2 services daily (but none on Sundays). Passengers must change train at Limerick Junction to continue to Waterford with stations at Tipperary, Cahir, Clonmel & Carrick-on-Suir. Limerick to Galway: 5 services daily. This service reopened on 29 March 2010. Limerick to Cork: Passengers can travel between Limerick and Cork via Limerick Junction. There is no direct service. Limerick to Killarney, Farranfore and Tralee: Passengers can travel between Limerick and Killarney, Farranfore and Tralee via Limerick Junction where trains run via Mallow to reach County Kerry. Limerick – Nenagh calling at Castleconnell and Birdhill (with some services continuing to Cloughjordan & Roscrea & connecting to the Dublin-Cork railway line at Ballybrophy.) Due to speed restrictions this alternative Dublin – Limerick route can take 60 minutes longer (with a change at Ballybrophy) than by Limerick Junction albeit a more direct service. There are also a number of disused railway lines including the Limerick to Foynes line which closed to freight in the early 2000s, having lost passenger services in the early 1960s, although the track is still in situ. This is the last remaining part of the North Kerry Line which closed to passenger traffic in the early 1960s and to freight traffic (other than Limerick – Foynes) in the mid-1970s, and has been lifted between Ballingrane (near Rathkeale) and Tralee. The Railway Procurement Agency has suggested that a tram system should be built in the city. Limerick's central location in the mid – west of Ireland means many important national primary routes converge on the city. The M7 (Dublin), N/M18 (Galway, Ennis, Shannon), N/M20 (Cork), N21 (Tralee) and N24 (Waterford) routes all start/terminate in or near the city. Road infrastructure has improved over the past decade with the completion of the southern ring road and Limerick Tunnel bypass of the city and the M20 bypass of Dooradoyle and Raheen to the south of the city. Connections to the other cities are improving also with the completion of the M7 motorway in December 2010, and continuing upgrades ongoing to the N/M18 to Shannon, Ennis, Galway and Tuam – the final section opened in September 2017. A motorway is also planned between Cork and Limerick, with an expected completion date in the mid 2020s. Historically, waterway transport has been key to Limerick's development. Vikings established the city as a maritime trading port. The city's position on a major Irish river system, the Shannon, enabled transport to the midlands of Ireland and further north and west. By the 18th Century with the opening of canal systems throughout Ireland, Limerick Port established itself as Ireland's premier commercial port on the western side of the country. This was enabled by ease of access from the facilitated by the opening of canals but most importantly to the River Shannon. The opening of the Grand Canal in the 18th century provided further access to Dublin and the east of the country. There are also a number of disused canals in the vicinity of the city including the Park Canal & the Passey – Errina Canal on the old Limerick navigation. Waterway transport on the Shannon was regularly used to transport goods from Limerick to Dublin and vice versa however this mode of transport fell into decline in the 20th century. Originally Limerick port was located near the confluence of the Abbey and Shannon rivers at King's Island. Today the port is located further downstream on the Shannon alongside the Dock Road and is operated by the Shannon Foynes Port Company who operate all marine activities in the Shannon estuary. It is a general purpose facility port. Plans to close the port and relocate all activity to the deepwater facility further downstream at Foynes have been abandoned. The plans included a major regeneration of the dockland area. Plassey House at the University of Limerick. Limerick is an important centre of higher education in Ireland. Technical and continuation education within the city traces its beginning back to the formation of the Limerick Athenaeum Society in 1852, marking the foundation of the Limerick Institute of Technology. The Society's aims included "the promotion of Literature, Science, Art and Music". Today, Limerick is home to a number of higher-education institutions including the University of Limerick, Limerick Institute of Technology and Mary Immaculate College and has a student population of over 20,000. The University of Limerick (UL), has a student population of over 13,000, and is about 5 km east of the city centre in the suburb of Castletroy. It was established as the National Institute for Higher Education (NIHE) in 1972, and in 1989 was the first university to be established since the foundation of the State in 1922. It is notable for its programs of engineering, information technology, materials science, sports science, humanities, teacher education, social sciences and music. In 2007, the university opened a medical school. The Irish World Music Centre specialises in traditional music and dance, and UL is host to the Irish Chamber Orchestra. The campus includes a 50m Olympic-standard swimming complex, the first to be established in Ireland. The University has one of the longest footbridges in Europe, called "The Living Bridge", designed by Wilkinson Eyre Architects of London. Thomond College of Education, Limerick was a successful teacher training college for secondary level and was integrated into the university in 1991. Limerick Institute of Technology (LIT) has a student population of 7,000 and is a centre for undergraduate and postgraduate education in business, engineering, information technology, humanities, science and art education. The main campus is located at Moylish Park, about 3 kilometres north-west of the city centre, and the School of Art & Design is located on campuses at Clare Street and George's Quay. Additional facilities and outreach centres are located at O'Connell Street and in Ennis, Co. Clare and LIT has two campuses in Co. Tipperary, LIT Thurles and LIT Clonmel. These were formerly the campuses of the Tipperary Institute which merged with LIT in 2011. LIT was originally established in 1852 as a School of Ornamental Art. In the mid-1970s it was incorporated as The Limerick College of Art, Commerce & Technology (CoACT) and achieved the designation of a Regional Technical College (RTC) in 1993 and finally an Institute of Technology in 1997. The Institute has a strong sporting ethos, which is not surprising given its location adjacent to Thomond Park and the Gaelic Grounds. It has a strong focus on business incubation, having operations in several enterprise centres: The National Franchise Centre; Croom Community Enterprise Centre; Thurles Chamber Enterprise Centre (TCEC); The Hartnett Enterprise Acceleration Centre (HEAC). Two further enterprise centres, the Enterprise and Research Centre, Clonmel and the Irish Fashion Incubator Limited (IFIL) will be added to its unique "Enterprise Ladder" in 2013. LIT is also home to the Millennium Theatre, a northside venue for shows and concerts. Mary Immaculate College is an education and arts college located just south-west of the city centre. The main focus is on the education of primary-level teachers. Mary Immaculate College is a constituent college of the University of Limerick. Griffith College Limerick (GCL) is a private college in Limerick. The college was established in 2006 when the Mid West Business Institute was acquired by Griffith College. The college runs full-time and part-time courses in accountancy, business, law, engineering, computing and IT and has a range of part-time courses available. Primary and secondary education in the city is organised in a similar fashion to the rest of Ireland. The City of Limerick Vocational Education Committee (CLVEC) provides education services for over 10,000 learners in the city at secondary and further education levels. It also runs Gaelcholáiste Luimnigh, an all Irish language secondary school. The other main secondary schools in the city are Castletroy College, Crescent College Comprehensive, Thomond Community College and Villiers which are all co-educational. Ardscoil Rís, St. Clements Redemptorist College, CBS Sexton Street and St Munchin's College are boys-only schools and Laurel Hill, The Presentation, Ard Scoil Mhuire and Scoil Carmel are girls-only schools. Rugby, Gaelic football, hurling and association football are popular sporting pastimes in Limerick. The city and suburbs also has many tennis, athletics, cricket and golf clubs. The city is host to many large sporting events. Recent examples include the 2008 and 2009 Irish Open Golf Championships, the 2010 Irish Special Olympics, the All-Ireland Corporate Games and the World Baton twirling Championships. Limerick has been designated as a European City of Sport for 2011 by the European Capitals of Sport Association (ACES). The National Elite Swimming Club is based in The University of Limerick Arena. Similar to the rest of Ireland, basketball was a popular sport in Limerick during the 1970s and 1980s, with up to four divisions in the men's and women's local leagues. It suffered a decline during the 1990s culminating in the complete demise of local league basketball in the city and surrounding areas. The main clubs in the city were St. Colm's and Marathon with St. Colm's in particular having a long history in the National Leagues. There has been somewhat of a revival in basketball in the city in recent years, particularly at underage level. Limerick is currently represented in the National Leagues by the men's UL Eagles team and the women's UL Aughinish team. They both play their home games at the 2,500 capacity University Arena at the University of Limerick. There are a number of other teams at school and club level, including St. Colm's, Limerick Lakers, Taste of Europe, Limerick Celtic and Limerick Lions. Limerick Cricket Club is a member of the Munster Cricket Union and plays in competitions organised by the Union. The club has in the past provided players for the Ireland national cricket team. Three rowing clubs are located in the city, namely Shannon Rowing Club, Saint Michaels Rowing Club and Athlunkard Boat Club. St Michael's member and Limerick native Sam Lynch won the World Championship gold medal in the Men's Lightweight Single Sculls in Lucerne in 2001, defending his title to take the gold again in Seville in 2002. Ireland's national sports of Hurling and Gaelic football are widely played in the city and its surrounding suburbs. Limerick won the All-Ireland Senior Hurling Championship in 2018 for the first time since 1973, having previously reached the finals in 1974, 1980, 1994, 1996 and 2007 and is one of the top four teams in the game, in terms of the All-Ireland Senior Hurling Championships won. The county won successive All-Ireland Under-21 titles in 2000, 2001 and 2002. The county's GAA teams display the Sporting Limerick logo. Sporting Limerick is a non-commercial brand developed to "capture Limerick City & County's unique sporting culture and to promote its place as one of Europe's leading regions for on field performances, off field facilities and its superb supporter base." Na Piarsaigh is the only city club playing hurling at senior level. Claughaun (Clochán), Monaleen (Móin a'Lín) and Mungret (Mungairit) compete at intermediate level and Old Christians (Sean-Chríostaithe), Milford (Áth an Mhuilinn), Saint Patrick's (Naomh Pádraig) and Abbey Sarsfields (Sáirséalaigh na Mainistreach) compete at junior level. Limerick won the first All-Ireland Senior Football Championship in 1887 when represented by the city's Commercials club and repeated the feat in 1896. Since then, the game has lived mostly in the shadow of hurling but a resurgence in 2000 saw the county win its first Munster Under-21 title and has since reached three Munster Senior finals. Monaleen (Móin a'Lín) are the only city club to play football at the senior grade. Saint Patrick's (Naomh Pádraig), Claughaun (An Clochán), Mungret St. Paul's (Mungairit Naomh Pól) and Na Piarsaigh are at intermediate level and Milford (Áth an Mhuilinn), Abbey Sarsfields (Sáirséalaigh na Mainstreach) and Ballinacurra Gaels (Gaeil Bhaile na Cora) play at junior level. A number of secondary school's compete in the Dr. Harty Cup, which is the Munster Colleges Hurling Championship. Limerick CBS has won the cup on 10 occasions, including four in a row from 1964 to 1967 and most recently in 1993. The school also won the Dr. Croke Cup, the All-Ireland Colleges Hurling Championship, on two occasions, in 1964 and 1966. Ardscoil Rís has won the championship on four occasions, in 2010, 2011, 2013 and 2015 and St. Munchin's College won it once, in 1922. Both the University of Limerick (UL) and Limerick Institute of Technology (LIT) have been successful in The Fitzgibbon Cup, the All-Ireland Higher Education Hurling Championship. UL first won the championship in 1989 and have won it four times in all. LIT's two wins came in 2005 and 2007. Both of the colleges met in the final in 2011, with UL scoring an injury-time goal to win. Limerick's Gaelic Grounds (Páirc na nGael), on the Ennis Road, is the county team's home venue for both sports and has a current capacity of 49,000 following reconstruction in 2004. In 1961 it hosted Ireland's biggest crowd for a sporting event outside Croke Park when over 61,000 paid to see the Munster hurling final between Tipperary and Cork. There are three golf clubs associated with Limerick city. Limerick Golf Club was founded in 1891 and is located at Ballyclough, 5 kilometres (3 mi) due south of the city centre. Castletroy Golf Club was founded in 1937 and is located in the suburb of Castletroy in the southwest of the city. Rathbane Golf Club is based at Rathbane Golf Course, a municipal facility opened in 1998 on the southern outskirts of the city and operated under license for Limerick City Council. Both Limerick and Castletroy have enjoyed considerable success at national level in inter-club competition. Limerick has won the Irish Senior Cup, the blue riband event of Irish amateur golf, on four occasions and was the first Irish club to win the European Club Championship, in 1980. Castletroy has won the Irish Senior Cup once. Limerick Golf Club was host to the JP McManus Invitational Pro Am, one of the largest pro-am events of its kind in the world. It has contributed over €95m to local charities since its inception in 1990. The event moved to the larger Adare Golf Club in 2005 as it had outgrown the Ballyclough venue. Adare also played host to the Irish Open in 2007 and 2008. Rugby Union is very popular in the city and is widely played at all levels. Limerick is often referred to as the home of Irish rugby. Since its inception in 1991 the All-Ireland League has been dominated by Limerick City teams, with three clubs winning the competition 13 times between them: Shannon (9); Garryowen (3) and Young Munster (1). The other senior clubs in the city are Old Crescent, Thomond, and UL Bohemians. Richmond and St.Marys are city clubs playing in the junior leagues. The city's secondary schools compete in the Munster Senior and Junior Cups and a number of schools have had notable success at both levels. The most successful rugby school in the city is Crescent College who have won the Senior Cup ten times, most recently in 2013, and the Junior Cup five times, most recently in 2010. The school is affiliated to Old Crescent RFC. St Munchin's have won the Senior Cup five times since 1968 and the Junior Cup three times. Although Limerick CBS is more noted for hurling success, it won the Senior Cup on four occasions in the 1920s and 1930s and the Junior Cup in 1932. Ardscoil Rís has won the Junior Cup twice, in 2003 and 2005 and Castletroy College won both senior and junior competitions in 2008. All Munster European Heineken Cup matches are played at Thomond Park Stadium, where the Munster team held a record of being unbeaten in the Heineken Cup for 26 consecutive games until the 16–9 defeat by Leicester in January 2007. Munster has won the Heineken Cup twice, in 2006 and 2008. The main street O'Connell Street was crowded for the 2006 match. Munster recorded a famous 12 – 0 victory against the New Zealand All Blacks in 1978 at Thomond Park and came close a second time when the teams met again in 2008, losing 18–16. Munster also defeated an Australian touring side at Thomond Park in 2010. Rugby league is also played in Limerick and the city is represented in the Munster Conference of the Irish Elite League by Treaty City Titans, the most successful Irish club and 6 times Elite League champions, and current Elite League champions Country Cowboys. A Limerick-based side is also planning to enter Super League by 2016 playing matches out of Thomond Park, it is also set to host high-profile rugby league matches including the 2013 Rugby League World Cup, an academy was also set up to identify players to play for Super League clubs. Football is very popular in the city and has more players involved than in any other sport. The city is represented in the League of Ireland by Limerick FC. The club first joined the league in 1937 and has been involved since then, although there have been a number of variations of the club. Their most successful period was from the 1960s to the 1980s when they won 2 League of Ireland championships and two FAI Cups. The club played at The Market's Field until the mid-1980s when they controversially moved to a new venue. A period of declining fortunes and a nomadic existence followed. The club is currently playing in the League of Ireland Premier Division, the top tier of Irish football. Limerick FC returned to The Market's Field on 5 June 2015, following the purchase of the venue by the Limerick Enterprise Development Partnership (LEDP) from Bord na gCon, the Irish greyhound racing authority. The purchase was funded by a donation from the JP McManus Charitable Foundation. Limerick Racecourse is located 10 km outside the city at Greenmount, Patrickswell and holds flat and National Hunt meetings throughout the year. Limerick has produced a World Boxing Champion, Andy Lee, the former WBO Middleweight Champion is from Limerick. In 2013, a new energy strategy was launched for the region of Limerick and Clare. The project is a short-term 2020 renewable energy strategy giving a 20% reduction in CO2-emissions, while ensuring that short-term actions are beneficial to the long-term goal of 100% renewable energy. The strategy was completed by the Danish Aalborg University. King John's Castle on the River Shannon. Another view of King John's Castle. A view along the quay in Limerick City. Limerick on the River Shannon as viewed from Bishop's Quay. Cast iron sculpture by Antony Gormley located in the Central Plaza of the University of Limerick. ^ "About Limerick". Limerick.com. Archived from the original on 25 April 2014. Retrieved 30 April 2014. ^ "Census of Population 2016" (PDF). Profile 1 – Geographical distribution. Central Statistics Office. 6 April 2017. p. 15. Retrieved 6 April 2017. 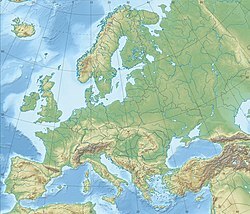 ^ a b "Database – Eurostat". Europa (web portal). ^ "Limerick – Definition of limerick by Merriam-Webster". merriam-webster.com. ^ a b "Census 2016 Municipal District Limerick". ^ "Census 2011 – Population Classified by Area (Table 5: Population of towns ordered by county and size, 2006 and 2011)" (PDF). cso.ie. Government of the Republic of Ireland. 2011. Retrieved 5 July 2015. ^ Hodkinson, Brian (2002). "The Topography of Pre-Norman Limerick". North Munster Antiquarian Journal. 42: 1–6. ^ a b "Limerick Port". libraryireland.com. ^ "Census for post 1821 figures". Cso.ie. Archived from the original on 9 March 2005. Retrieved 12 August 2010. ^ "Histpop.org". Histpop.org. 2 April 2007. Archived from the original on 7 May 2016. Retrieved 12 August 2010. ^ NISRA. "Nisra.gov.uk". Government of the United Kingdom. Archived from the original on 17 February 2012. Retrieved 12 August 2010. ^ "Cllr Liam Galvin elected Mayor of Limerick City and County Council". limerickleader.ie. ^ "Jerry O'Dea elected as new Mayor of Limerick's metropolitan district". limerickleader.ie. ^ "List of the Mayors and Sheriffs of Limerick City – 1197–present". Archived from the original on 13 March 2007. ^ "Limerick City Development Board – Strategy for Economic and Social Development" (PDF). Archived from the original (PDF) on 18 November 2007. ^ "The Irish Times, Local Election Results for Limerick County Council". The Irish Times. ^ From met.ie (Met Éireann); see "Shannon Airport (Weather Observing Stations)". Archived from the original on 29 December 2011. Retrieved 14 June 2011. ^ EVA International (Exhibition of Visual Art), Ireland. ^ "Lime Tree Theatre – Limericks Premier Live Venue". Lime Tree Theatre. ^ Belltable Arts Centre goes into liquidation – RTÉ News. Raidió Teilifís Éireann. Retrieved 23 July 2013. ^ "About Us". The Frank McCourt Museum. 2013. Retrieved 27 May 2013. ^ "'The Real Thing' begins Limerick shoot". Flagship Media Group. 8 November 2002. Retrieved 24 October 2018. ^ "Filmed in Limerick". Limerick.ie. Retrieved 24 October 2018. ^ "Irish Film and Television Network - Locations in Ireland - Limerick Location Services - Filography". Irish Film and Television Network. Retrieved 24 October 2018. ^ "Riverfest 2nd – 5th May 2014". Limerick.ie. ^ Kathryn, Hayes (6 May 2014). "Riverfest attracts record numbers to Limerick city". Limerick Independent. ^ Loomis 1963, pp. 153–157. ^ The phrase "come to Limerick" is known in American slang since the Civil War, as documented in the Historical Dictionary of American Slang and posts on the American Dialect Society List. One possible derivation of the phrase, proposed by Stephen Goranson on ADS-list, is the Treaty of Limerick, implying "surrender," "settle," "get to the point". ^ "Limerick city street names beginning with N". Limerick's Life. ^ "LimerickCity.ie/CityMuseum". Archived from the original on 26 June 2011. ^ "List of antipodes". Archived from the original on 24 February 2011. ^ "Census reveals Irish population now over 4.58m". RTÉ News. 30 June 2011. ^ "CSO.ie – 2006 Census preliminary report – See 'Limerick City', 'Meelick rural area' and 'Limerick rural area'" (PDF). ^ a b Hurley, David (2 July 2012). "Limerick estates are unemployment blackspots". Limerick Leader. Archived from the original on 4 July 2013. Retrieved 27 May 2013. ^ Lysaght, W. (1968) "The Abbey Fisherman" The Treaty Press Ltd, Limerick. ^ "Livable Limerick". The Business Report. January 2017. Retrieved 14 July 2017. ^ Sharrock, David (8 January 2009). "Dell delivers blow to Ireland with plant closure". The Times. London. ^ "50 new high-tech jobs for Dell's Raheen plant". Limerick Leader. 30 March 2010. Archived from the original on 2 April 2010. Retrieved 27 May 2013. ^ "1,900 jobs lost at Dell in Limerick". RTÉ News. 8 January 2009. ^ "Milk Market wins RIAI award". Dennany Reidy Associates. Archived from the original on 19 June 2013. Retrieved 23 July 2012. ^ "Bus Éireann enhances Limerick City network". Limerick Post Newspaper. 3 December 2016. Retrieved 10 December 2016. ^ "Enhanced Limerick City Network December 2016". buseireann.ie. Retrieved 26 August 2016. ^ "M7 Express Bus Service from Ennis to Dublin City via Limerick and Kildare – Dublin Coach". dublincoach.ie. ^ "Limerick station" (PDF). Railscot – Irish Railways. Retrieved 5 September 2007. ^ "M17/M18 Motorway". Raidió Teilifís Éireann. 27 September 2017. ^ "M20 Motorway". Raidió Teilifís Éireann. 13 October 2017. ^ Lane Joynt, William, Suggestions for the Establishment of a Limerick Athenaeum, 1853. George McKern & Sons, Limerick. ^ Mary Immaculate College. Education in Ireland. Retrieved 8 March 2011. ^ University Arena Archived 9 October 2011 at the Wayback Machine, University of Limerick Foundation. Retrieved 8 March 2011. ^ "Arup wins award for Living Bridge". irishconstruction.com. Archived from the original on 2 April 2009. Retrieved 17 December 2008. ^ "LM085 Bachelor of Engineering in Civil Engineering". University of Limerick. Archived from the original on 21 July 2011. Retrieved 17 December 2008. ^ TI future secure in new merger with Limerick Archived 3 September 2012 at Archive.today, The Nationalist, 22 February 2010. Retrieved 24 February 2012. ^ "WBTF Championships 2008". Archived from the original on 25 March 2008. Retrieved 27 August 2018. ^ Limerick European City of Sport 2011[permanent dead link], Shannon Development, 15 October 2010. Retrieved 8 March 2011. ^ Sporting Limerick Facebook Page. Retrieved 8 March 2011. ^ UL come from behind to win Fitzgibbon Cup, Sports News Ireland, 25 February 2011. Retrieved 8 March 2011. ^ Gaelic Grounds eSports Manager. Retrieved 8 March 2011. ^ Cotter, Patrick J., A History of Limerick Golf Club, 1891 – 1991, 1991, The Treaty Press. ^ JP McManus named Limerick Person of the Year for 2010, The Irish Times, 11 February 2011. Retrieved 8 March 2011. ^ Tournament History Archived 13 July 2011 at the Wayback Machine, JP McManus Invitational Pro Am. Retrieved 8 March 2011. ^ Limerick Rugby Full Of Heroes, The Daily Telegraph, 24 May 2002. Retrieved 8 March 2011. ^ Limerick Ready To Create Legends, The Independent, 27 May 2000. Retrieved 8 March 2011. ^ "Rugby". Limerickslife.com. 20 May 2006. Retrieved 27 May 2013. ^ Munster Beat Australia At Thomond Park Archived 22 December 2010 at the Wayback Machine, The Limerick Post, 17 November 2010. Retrieved 8 March 2011. ^ "IRELAND AIM FOR SUPER LEAGUE SIDE". Sporting Life. 1 May 2011. Archived from the original on 18 January 2012. ^ "Limerick launches bid for Rugby League World Cup games". Thescore.ie. 9 May 2013. Archived from the original on 29 July 2013. Retrieved 27 May 2013. ^ Dunne, Eoin, Limerick's recovery starts to take shape, Irish Independent, 26 January 2006. Retrieved 8 March 201. ^ Limerick FC look set for return to Market's Field, The Irish Times, 3 March 2011. Retrieved 8 March 2011. The Memoirs of John M. Regan, a Catholic Officer in the RIC and RUC, 1909–48, Joost Augusteijn, editor, District Inspector, Limerick 1920, ISBN 978-1-84682-069-4. Wikimedia Commons has media related to Limerick. 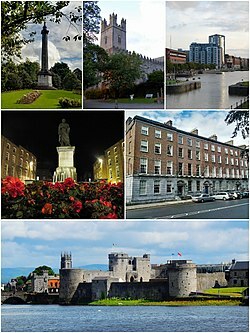 Wikivoyage has a travel guide for Limerick. This page was last edited on 12 March 2019, at 16:01 (UTC).